Genre: I guess this could be used for Fine Art Photography only, unless we add a brand or something else that would put it into a particular context. My idea was simply to play on the word “cupcake”, as you can see. Concept: I wanted to do a series that was very brightly coloured and my first idea was to try and visually represent some names I found in a pastry cookbook (“rock” cake, “black forest” cake…). “Cup”cake was the easiest one (I might keep on working on this series later on) and I tried to make both images as different as possible, but with a certain typology (angle, cropping, vantage point…). Shoot: I did the shoot in my kitchen, with a flash and some white cardboards. I shot everything separately (except the tea, of course!) 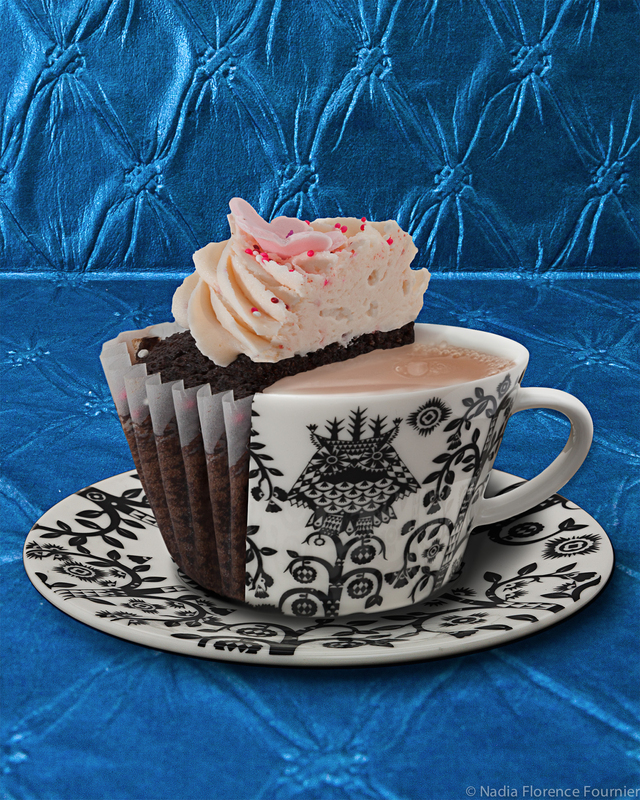 and used 4 different pictures for each image (saucer, cup, tea, cupcake). I also added the shadows by dodging and burning. I worked really hard in Photoshop and even if it’s not perfect, I’m quite happy with the result. It looks a lot better than my last composite assignment and I managed to get the result I had in my head, a first! !